Over the past 10 years at least, sea levels have been rising relatively steadily. This is mostly due to melting glaciers and ice sheets, and is a natural — if detrimental — consequence of global warming. The rate of ocean level rise has been a little over 3 millimeters per year (about 1/8th of an inch per year)… until last year. The rate of increase suddenly reversed itself in 2010, and the sea levels actually dropped a bit, by about 6 mm. What happened? 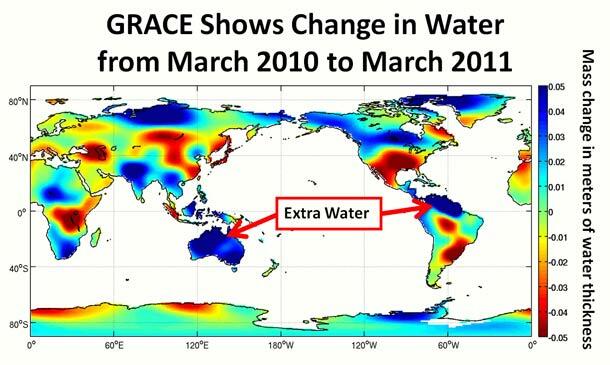 So where does all that extra water in Brazil and Australia come from? You guessed it–the ocean. Each year, huge amounts of water are evaporated from the ocean. While most of it falls right back into the ocean as rain, some of it falls over land. "This year, the continents got an extra dose of rain, so much so that global sea levels actually fell over most of the last year," says Carmen Boening, a JPL oceanographer and climate scientist. Boening and colleagues presented these results recently at the annual Grace Science Team Meeting in Austin, Texas. That’s pretty interesting! I didn’t realize it could rain so much that sea levels could be affected, but there you go. Doing the math, I find that a 6 mm drop is equivalent to a volume of very roughly 700 billion cubic meters of water, or 700 cubic kilometers (about 180 cubic miles). That is a lot of water! Spread out over so much area though — Australia alone is 3 million square km — it gets thinned out considerably. Still, all that extra rain is no picnic; floods in Australia killed several dozen people over the past year and destroyed a vast amount of industry and infrastructure there. Mind you, as I said increasing sea levels are an indicator of global warming, since ice melting in Greenland, for example, flows into the ocean. Does this mean the drop in sea level indicates global warming has reversed? Nope. El Niño and La Niña conditions are cyclical, swapping every few years. As global warming continues, the sea levels will rise steadily, but superposed on top of that are the effects of short-period oscillations like El Niño and La Niña. It’s very common in science to see a linear trend with a cycle on top of it; you have to be careful when interpreting such a plot to know if what you’re seeing is long-term change or short-term. This decrease in sea level is short-term, and when we switch back to El Niño conditions — warmer equatorial ocean temperatures — the trend will reverse once again, and sea levels will start to rise steadily. I’m writing about this for two reasons. One is that I think it’s interesting science, and shows how important it is to understand trends that can add or subtract from each other, and how satellite data are critical to understanding our environment. The other reason is, of course, that I expect we’ll be hearing from global warming deniers who will tout this finding as more proof that climate change isn’t happening. I want to head that off at the pass. These data show that the world’s weather does change on a short time scale, but once you account for that, the imprint of global warming is still there, still real, and still affecting us all. Image credits: Sea level measurements: S. Nerem, University of Colorado; GRACE water map: NASA/JPL-Caltech.